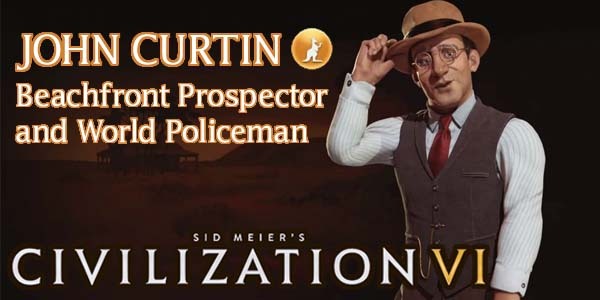 I've already written guides for some of Civilization VI's vanilla newcomer civs and leaders, so now I'm going to move onto one of the DLC civilizations that makes its first appearances in the franchise: John Curtin's Australia. This civ and leader are part of the "Deluxe Edition DLC". If you purchased the Deluxe Edition of the game, then you received this DLC (among others) for free when it was released. If you do not own the Deluxe Edition, then this DLC costs $5 USD. Australia is currently the sixth largest country in the world (by land area) and is the only contemporary country that occupies an entire mainland continent. The continent was inhabited by the hunter-gatherer aboriginal Australians as long as 70,000 years ago, but very little is known about their history and culture. It is believed that they arrived on the continent via land bridges in Southeast Asia (probably connecting Indonesia and New Zealand to mainland Asia). The Dutch were the first Europeans to reach Australia in 1606, but it was the English that began colonizing the island-continent in 1788 to act as a penal colony in response to the recent American independence, which lead to a rapid decline in the native population. By the mid 1800's, Australia had ended the prisoner transport, and the colony began its transition into a full-blown nation. John Curtin was the prime minister of Australia throughout most of World War II. He was appointed after the previous prime minister, Robert Menzies, was deposed by his own party. Curtin aligned Australia closely with the United States, which upset many British traditionalists, but proved instrumental in preventing the Japanese capture of the Philipines from turning into an invasion of mainland Australia. Curtin's leadership during the war, and his popular social service programs allowed him to coast to a mid-war re-election victory in 1943, but he did not complete that term due to rapidly-deteriorating health that lead to his death in 1944. He remains one of Australia's most beloved prime ministers. Civilization VI is still very early in its life-cycle. Strategies for the game (and for specific leaders and civs) may change as Firaxis applies balance patches, introduces new features, or expands the game through DLC or expansion packs, or as the Civ community discovers new strategies. As such, the following strategy guide may change from time to time. I will try to keep it up-to-date, and will make notations whenever changes are made. I'll also post links in the official 2K forums and CivFanatics, where I'll also report any changes made. If possible and practical, I will try to retain the original content of the strategy for posterity. In Civilization VI, Australia is a civilization that favors expansion along coasts and wherever they have access to pasture animal resources. 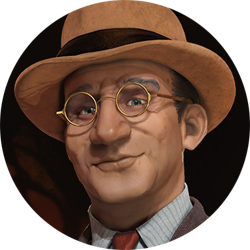 John Curtin is a defensive leader who can act as a sort of "sleeping giant" "world police", who can churn out a large military quickly if he is ever the target of a war or if he liberates another player (or city state) city.